It's always nice to reach a new milestone as an agency, even after seventeen years of existence. Today we are happy to announce our first graphic novel deal, and it's a doozy! Namrata Tripathi at Dial has acquired CREAKY ACRES, a middle-grade graphic novel by First Second executive editor Calista Brill and McDuffie Diversity Award-winning illustrator Nilah Magruder, in a three-book deal at auction. CREAKY ACRES features a lovable cast of characters at a run-down horse barn, including new girl Nora, who has to adjust to the change from fancy suburb to poor rural community, from moneyed equestrian center to Creaky Acres, and from being one of the few black girls riding horses in her area to being the only black kid in the whole town. Publication is set to begin spring 2019. Erin Murphy of Erin Murphy Literary Agency represented Brill and Jean Sagendorph of Mansion Street represented Magruder in the deal for world rights. We were so thrilled with the reception this one received when it out on submission, and we're over the moon about how it landed. The trio of Calista, Nilah, and Namrata are going to bring an incredible book out into the world. Huge congratulations to all, and especially EMLA'er Calista! It’s a Big-Time Breakout Debut for Elizabeth Acevedo! When I first read Liz's manuscript, I knew she had something special. Vibrant, rich, moving, and powerful in every sense of the word—this is a book that will be read and remembered. Rosemary Brosnan at Harper Collins has won, at auction, publication rights to acclaimed poet Elizabeth Acevedo's debut novel, The Poet X. The story follows Xiomara Santiago--a Dominican-American teenage writer who is struggling with her faith, her family, and her feelings for a boy--as she discovers the power of slam poetry to give voice to her feelings. Publication is set for winter 2018. Ammi-Joan Paquette of Erin Murphy Literary Agency did the deal for North American rights. Mark your calendars now, folks—this is one you're not going to want to miss! New Picture Book Coming up from Dan Richards! Any day with a new picture book announcement in it is a wonderful day—and the more so when that picture book is authored by the inimitable Dan Richards! Dan is one of those authors with a fabulously versatile voice: his published books include Can One Balloon Make an Elephant Fly? and The Problem with Not Being Scared of Monsters. But today we're here to talk about something brand new! Once Upon a Goat is a hilarious original fairy tale, wherein a king and queen make a wish for a child. Boy or girl? Well . . . any old kid will do. What comes next? Antics, mayhem, and tons of fun. I'm delighted to share that Once Upon a Goat has been acquired by Kelly Delaney at Knopf, and will be illustrated by Eric Barclay. Reidy and Chou Times Two! Jean Reidy picture books ALWAYS make for good news, and we are so happy that two of her texts now have an illustrator and a publication schedule! WHEN THE SNOW IS DEEPER THAN YOUR BOOTS ARE TALL and GROUP HUG were sold to Laura Godwin at Holt in the spring, and now comes word that they will be published by Laura's new Godwin Books imprint in fall 2018 and winter 2019, with fantastic illustrations by Joey Chou, who is represented by Kirsten Hall of Catbird Productions. We're so happy to have this news out in the world, and to see this author-illustrator partnership start with the bang of two books! Congratulations, Jean! THE NIAN MONSTER is available now! 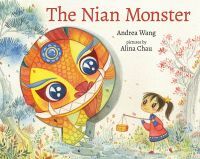 We are so excited to be celebrating the release of Andrea Y Wang's THE NIAN MONSTER today! Huge congratulations, Andrea!